I was watching a comic reviewer on YouTube. He did not like the book, because Bruce Wayne’s goal is ‘to be happy’ and that’s a sissy goal according to a nerd who reviews comic books… every day… I do not particularly care about Batman, but I do care about audience opinion (now I’m the nerd). I find it interesting how audiences dislike the simple goal of ‘happiness’. I tried to wrap my head around a goal that is superior to happiness. Why do we detest a utopia? Why we enjoy suffering? The answer is authenticity. I came to realise authenticity is the real vague goal of mankind. For me, to be an authentic person is to un-shamefully express your inner self (morals, ideas, personality etc) seamlessly as your outer self (physical appearance, job, social status etc). Humans have a tendency to outwardly lie about their authenticity – even to themselves. Social media has allowed for the epitome of falsehoods. Finally, we have created a toll to share our true selves with 2.5 billion social users, millions of whom are bound to share your ideals and what do we do – we forsake authenticity because of superficiality. We chose our 140 characters wisely – as to not get fired over creepy tweets (cough cough James Gunn). In a study by The Florida House, 28% of women take 6-10 selfies before posting and 6% take over 21. 44% of women take 1-3 mins to edit their selfie before posting. We have become dependent on filtering ourselves. How long must the chat ellipsis appear before you post you are inevitable one word answer to your crush?! Now editing our digital self has translated to the physical. Generation Z has become addicted to lip fillers and jaw jobs. Dubbed ‘snapchat dysmorphia’ plastic surgeons are seeing rises in requests to look like Insta selfies. For me this represents a desperate plea for women to look like the warped feminine ideal. The most popular filters exemplify the socially acceptable construction of the feminine mind. Think about the bunny ears and 3d flower garlands. They exemplify neotenous (baby like) and girly features. The ai makes your forehead, lips and eyes bigger and your chin smaller – making you appear like a less freakum Bratz doll. To most women the selfie is the epitome of your digital self – so why do we want to look like children? Why do we want to look harmless? Furthermore, we all want to look like Kardashians. It’s interesting how women wish to achieve the mixed race/ambiguous look. I remember when I was a baby and pencil thin brows were the thing. Contouring started to appear in the 2010’s and everyone thought those girls looked ridiculous. Remember when it was just a subculture and not mainstream? How everyone called those girls clowns – I do and we were all part of it. Then suddenly social media boomed, the Kardashian were in and social media opened the UK up to insta models from across the globe. 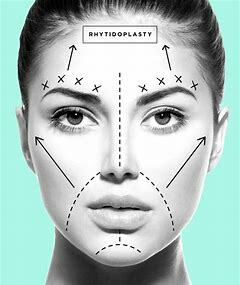 The Kardashian look took off because it was so translatable to all races – if you have thick brows you don’t have to tweezer, and you could create your own nose lines and jaw lines and high cheekbones were suddenly in. You could be the average race and receive and average amount of likes instead of embracing your uniqueness and risk getting ignored. Even Missy Elliot, one of the most authentic artists of the 90s/2000s has fallen victim to contouring. She looks fantastic but she doesn’t look like the unique Missy I remember. And when your phone is on charge and your bath washes your contouring away you see your real adult self, your real race staring back and its beautiful. For me maintaining your natural beauty is so intertwined with authenticity. I don’t expect women to quit make up and selfies, I can’t even quit them. But to be able to go home and not see the real nose your mother gave you, your real skin, wrinkles, hair and smile deeply saddens me. Humans have always found ways to edit themselves, from our cloths to our social etiquette but behind the social coverings we have our natural body’s. Under the bedsheets, with our lovers (or ourselves) we are naked, and hopefully we are able to share our authentic selves with our partners.